You probably recognize this novel from July 17th post: Guest Blog: Matter of Resistance: Six Years in the Making. But today is THE DAY. That’s right. It’s the release day! Matter of Resistance is now available. So I asked author, Raymond Vogel, to give my readers a little insight into this science-fiction story, and he did! (August 14, 2013–Tullahoma, TN) Raymond Vogel is a rocket scientist-turned-writer who worked as a systems engineer on NASA’s Orion Program. 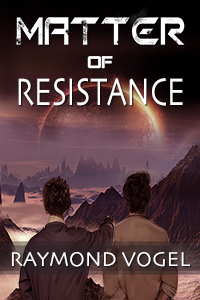 His science fiction imagining, MATTER OF RESISTANCE (AEC Stellar Publishing Inc., August 22, 2013), pushes technology and human nature to the limits as it chronicles our Mars settlement’s struggle for independence from Earth. Born into a world of political tension, the book’s central character, Isaac, is one of the brightest members of the upcoming Martian generation. With a number of his peers and a curious, new element known as Magnematter, Isaac builds on the technologies of the past to accomplish previously impossible feats. But he will soon have to weigh the continued defense of Mars against a devastating attack on Earth, as he struggles to hold on to his childhood values in the midst of conflict and loss. Meanwhile on Earth, Robert Daniels is an average employee at the space trade giant Red Planet, Inc. He doesn’t always agree with the political motivations of his management chain, and their ruthless search for more Magnematter, but what can he do? Luckily, his new relationship to the clever May Gadeshi has been a welcome distraction. That is, until he learns of her involvement in the elusive activist organization known as Mr. G. Fraught with mixed feelings of love and betrayal, Robert will have to choose sides before it is too late for him make a difference. So check it out! And don’t forget about my Writing Competition & Giveaway! I’m looking forward to reading more entries and giving away books to those talented writers. Press Release; Matter of Resistance by Raymond Vogel. We’re kinda having a party to celebrate around the world! 😀 You will enjoy this fantastic book! This sounds like a wonderful read. I thought at first, “I bet my daughter would like this,” but as I read on, that changed to “she’ll have to wait until dad’s done with it!” A fascinating subject.